Providing Computer technical services ranging from Enterprise level High Availability and Data Protection to helping Grandma with her home PC. Supplement or mentor junior/mid level staff. Senior level support to provide relief or backup support for junior to senior level staff -- vacations, illness, heavy workloads. Support for clients who do not need full-time IT support staff. Enterprise Sun Solaris administration with a focus on low maintenance and scalability. Storage and backup solutions: Sun, EMC, SAN, Veritas Netbackup, Legato Networker. Network architecture, router/switch installations and configuration. Firewall -- Cisco PIX, Checkpoint, Sunscreen, Linux IPtables, VPN. Security architecture and Server hardening. Oracle database design, administration, development and support. Cross platform database migration (Oracle, Sybase, SQL,Tandem). Veritas products: Cluster & Netbackup. Custom curricula or simply hands-on mentoring. CGI in PERL, PHP, etc. 1 to 6 month projects. Aries consultants have the knowledge and experience to get the job done quickly and efficently, without the long-term expense of a hired employee. Small to medium shops may find it more cost-effective to use an Aries consultant rather than hiring junior-level staff. Get senior level results by leavening junior staff with an Aries consultant. Aries consultants provide services in a wide variety of environments, so we know how to architect computing environments for reliability, low maintenance, and low total cost of ownership. Hiring restrictions may impact projects. Aries services can be an effective strategy for getting projects done within budget. Qualified staff may be difficult or impossible to recruit. Project timelines may require immediate staffing. 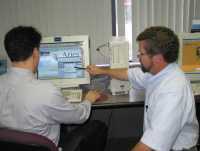 On-site consulting using Aries consultants can be a cost-effective alternative for training staff. See the article on the Typhoid Mary of the Internet! a subsidiary of AM-PM Inc.